Whether your child learns well after lunch or dozes through afternoon classes can be influenced by the proteins in the lunch and the carbohydrate company these proteins keep. Protein foods which contain the amino acid tryptophan tend to sedate the brain, and protein foods containing the amino acid tyrosine wake up the brain. Rich dietary sources of tryptophan are eggs, milk, bananas, dairy, sunflower seeds, and meat. Eating a lot of carbohydrates with tryptophan- containing foods increases their sedative effect. The carbohydrates trigger the release of insulin, which sends the amino acids that compete with tryptophan into muscle tissue. This allows more tryptophan to get into the brain. Serotonin production goes up and sluggishness follows. Fewer carbohydrates and calories with more protein, on the other hand, makes the eater more alert after lunch. The amino acid that perks up the brain is tyrosine, found in seafood, turkey, tofu, legumes, and tuna. So, a salad of legumes with tuna, tofu, or turkey would be the ideal lunch to aide with work and learning in the afternoon rather than drift off from foods that make you sleepy. 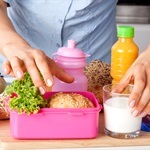 Even the order in which you eat the food in your lunch can affect afternoon performance. Whether the brain will rev up or slow down depends on whether tyrosine or tryptophan gets into the neurotransmitters first. Eat the protein first, and you allow the amino acid, tyrosine, to wake up the brain. Then when you eat the carbohydrates, the tryptophan ushered into the brain by insulin will have less effect. So, if you want to wake up the brain, eat a high protein lunch and eat the protein before the carbohydrates; if you want the brain to relax, eat a high carbohydrate lunch and eat the carbohydrates before the protein. A healthy lunch for school-age children would contain between 600 and 800 calories, with a balance of complex carbohydrates and proteins and a minimum of fats. A high calorie, high carbohydrate meal, such as pasta with a fat-laden sauce, is likely to diminish your child’s academic performance after lunch. A meal high in unhealthy fats diminishes mental alertness by diverting blood from the brain to the stomach to help with digestion. An example of a healthy lunch would be a tuna sandwich on whole wheat bread with lettuce, tomato, and a mayonnaise made with canola oil, a side salad, a piece of fruit, and a glass of milk. Encourage your child to skip dessert after lunch and to save his daily dessert treat for after dinner. In many schools, the hot lunch programs are a nutritional failure. Based on the lunches that are served, many schools deserve the behavior they get from children after lunch. Fast-food favorites are now taking over the counter space in school cafeterias, teaching children that the four food groups are: burgers, fries, pizza, and chicken nuggets. Get involved in your PTA and make the topic of healthy school lunches a high priority. Also, monitor what is sold in the vending machines and lobby for juices rather than heavily sugared, high caffeine sodas.